The Biosphere Potsdam is a tourist attraction and can also be used all year round as a location for various major and small-scale events. Whether incorporated into a complete package or just as an event location, the Biosphere Potsdam is perfect for private and corporate events. As well as organising your event, we also offer fringe programmes and entertainment. Our professional F&B management team rounds off the overall picture. Our catering team will provide you and your guests with indulgent culinary highlights and can fulfil all your requirements up to 1,200 guests. 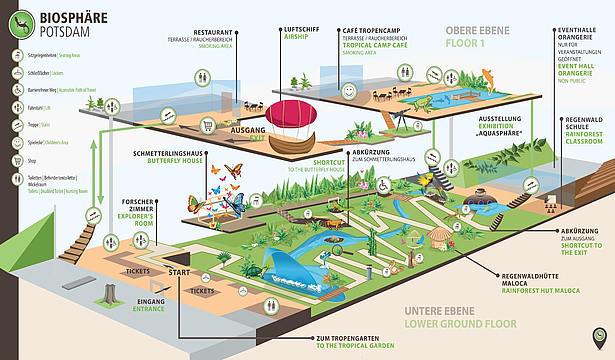 Discover our different premises for your tropical event below.